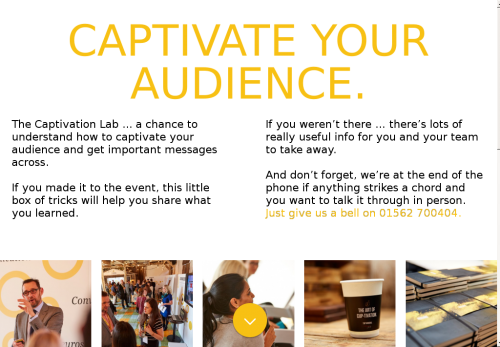 The Captivation Lab … a chance to understand how to captivate your audience and get important messages across. If you made it to the event, this little box of tricks will help you share what you learned. If you weren’t there … there’s lots of really useful info for you and your team to take away. And don’t forget, we’re at the end of the phone if anything strikes a chord and you want to talk it through in person. The Captivation Lab ... a chance to understand how to captivate your audience and get important messages across. And don’t forget, we’re at the end of the phone if anything strikes a chord and you want to talk it through in person. Just give us a bell on 01562 700404.